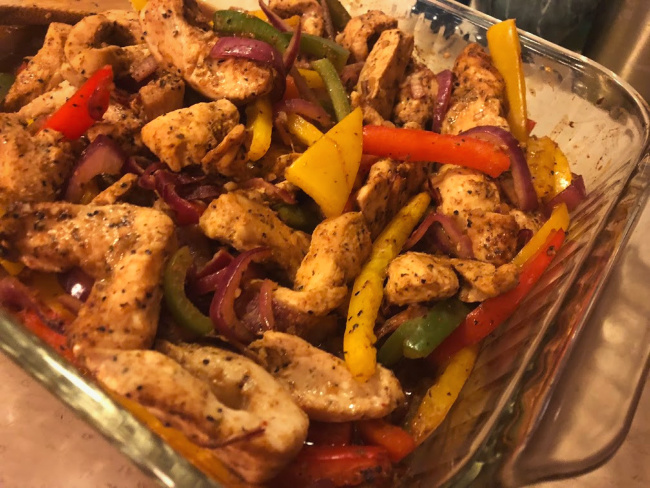 I have been working on this baked Chicken Fajita Recipe for a long time and has become a regular on our menu rotation. This recipe is so easy to make and cooks quickly in the oven, or can be thrown into an aluminum pan and cooked on the grill or cooked over a campfire. 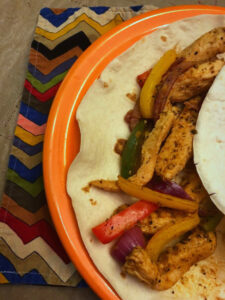 Any way you cook it, the end result is a tasty fajita dinner! Mix spices and olive oil until well blended. 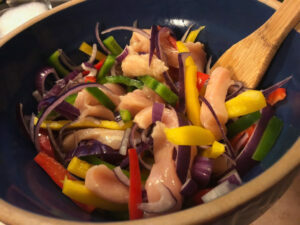 Cut veggies and chicken into 1/2 inch strips. Mix chicken, vegetables and spice blend together. Spread chicken fajita mix into a 9×13 glass casserole dish. Bake for 20 minutes or until chicken is cooked through. After the chicken and veggies are cooked serve them in heated soft tortillas with your favorite toppings like tomatoes, guacamole, salsa, cheese or sour cream. Visit my RECIPE ARCHIVES for more delicious dinner ideas!